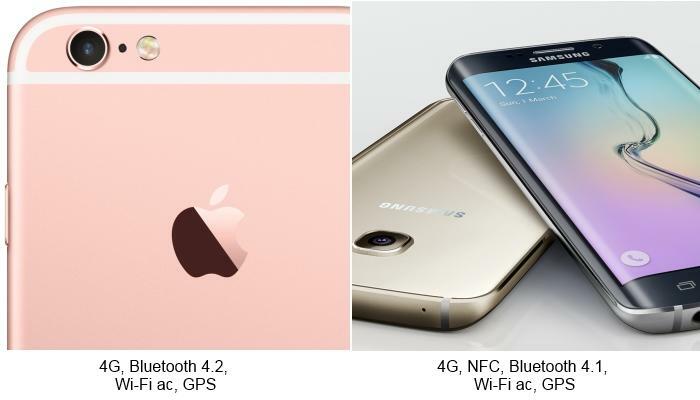 The rivalry between Apple and Samsung is intensifying with the impending release of the iPhone 6s. A few small upgrades add up to make a significant difference in this generation iPhone. There’s the new 3D Touch, a feature with the potential to streamline how we use smartphones, and the first upgrade in camera resolution in four years. 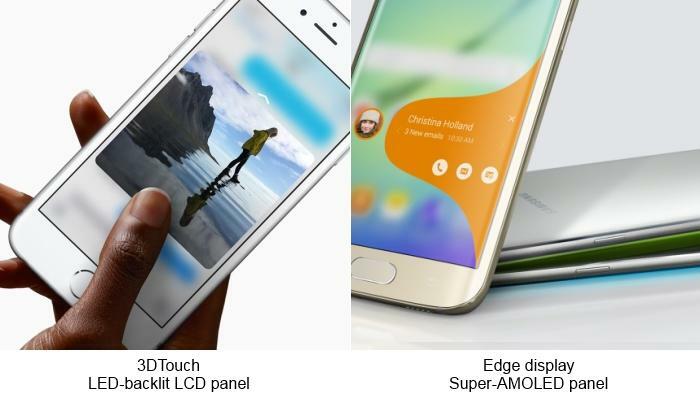 Standing between Apple and prospective customers is the Galaxy S6 Edge from Samsung. This generation Galaxy was overhauled in almost every way conceivable. It’s a remarkable achievement, as evidenced in our review, in which the S6 Edge was only the second smartphone to be awarded 5 Stars. The competition between Apple and Samsung is stiff, but before this showdown’s end, a winner will emerge. Weight for the iPhone 6s has increased over the previous model on account of the technology behind 3D Touch. The Galaxy S6 Edge on the other hand has dropped in weight compared to the plastic-clad Galaxy S5. It's also interesting to note the S6 Edge is lighter than the iPhone 6s in spite of Samsung's smartphone packing a larger display. Remember bend-gate, the debacle that had 6 Plus owners worrying their smartphone was going to bend? 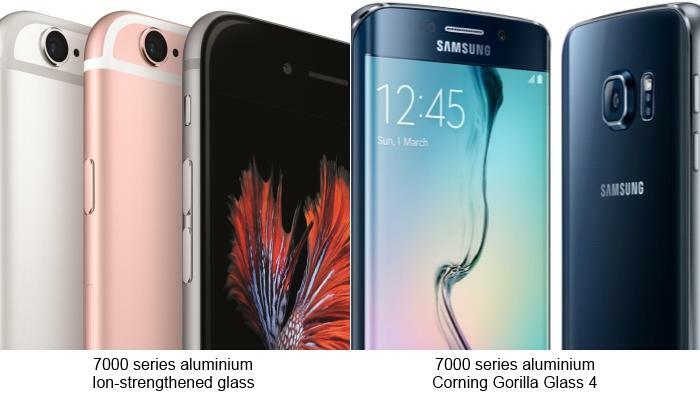 Apple is trying to avoid a similar saga by using a different grade of aluminium in its 6s. The 7000 series is the same kind found in the Galaxy S6. One innovative technology headlines each generation of iPhone and this year it is 3D Touch. The technology essentially recognises pressure placed on a screen, but it is how Apple uses this technology that makes it a breakthrough. 3DTouch links the different functionalities of applications by opening one application within another. Samsung has altogether taken a different approach by redefining the dimensions of its screens. The S6 edge uses its waterfall-like display to populate favourite contacts, feed notifications and provide updates on the phone's status. This part of the comparison appears to be a one sided fight. The display on the Samsung's smartphone is larger, has a higher resolution, a greater pixel density and uses a next-generation panel technology. Benefits include improved clarity, brighter colours and darker blacks. Four years have passed since Apple upped the resolution of the iPhone's camera. 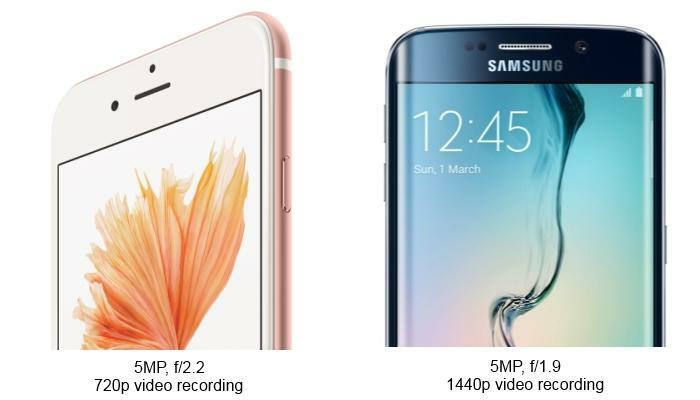 The 4.7-inch 6s can capture photos 12-megapixels in size and will record 4K videos. It has an aperture of f/2.2; however, unlike the phablet version of Apple's iPhone, it does not come with optical image stabilisation. Samsung's flagship smartphone has solid camera credentials with photos 16-megapixels large and 4K video recording. Its f/1.9 aperture will allow more light into the lens than Apple's, while the inclusion of optical image stabilisation will help keep photos in focus during low-light situations. The front cameras tell a tale similar to that of the primary cameras. 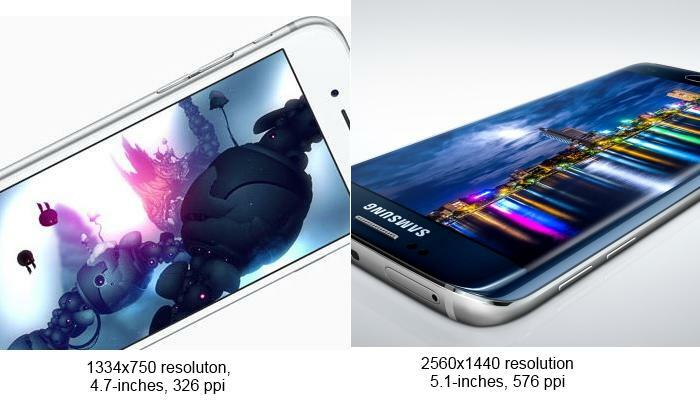 Both smartphones can take 5-megapixel photos, but that's as far as it goes for similarities. 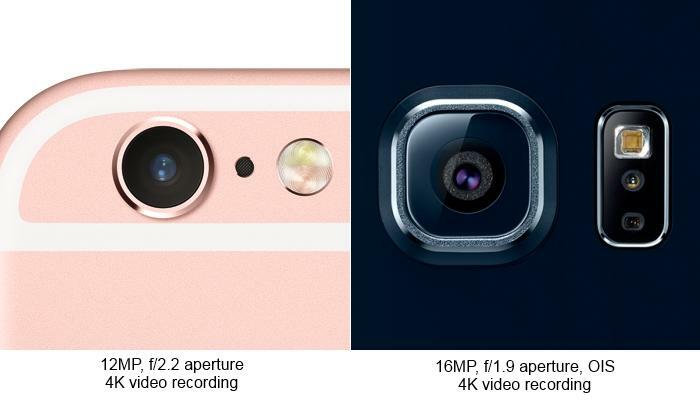 The 1440p videos recorded by the S6 Edge will be larger than the 720p footage captured with the iPhone 6s, while its f/1.9 aperture outperforms the iPhone's f/2.2. Both have finger scanners and both use them to authorise transactions, BUT neither Apple or Samsung have released their smartphone transaction systems in Australia. 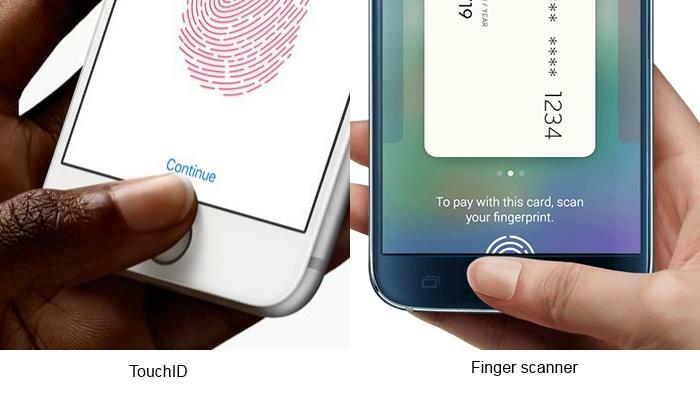 Samsung claims it will introduce Samsung Pay in 2016; Apple has not revealed its plan's for the local market. Apple plays coy when it comes to the specifications of its processor. The company has not revealed how many processing cores make up its A9 chip, or the speed at which they operate. 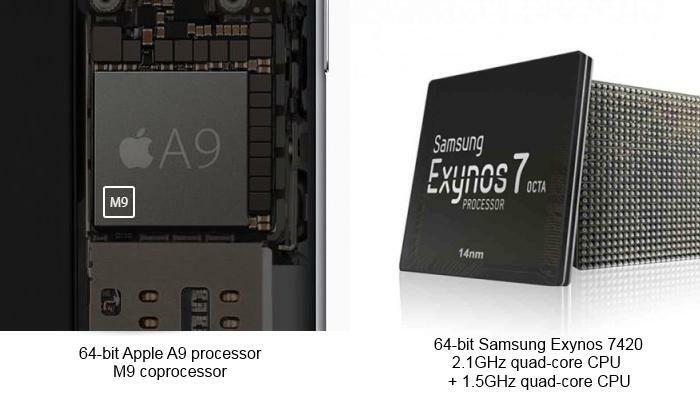 Apple only claims it is faster than last year's A8 chip and it is presumably more economical. Then there's Samsung's Exynos chip, which is based on the 14nm fabrication process. It combines two quad-core CPUs, one operating at 2.1GHz and another at 1.5GHz, alternating between them depending on the demands of a given task. Apple set the tempo here as it has always eschewed support for microSD cards in favour of faster internal storage. 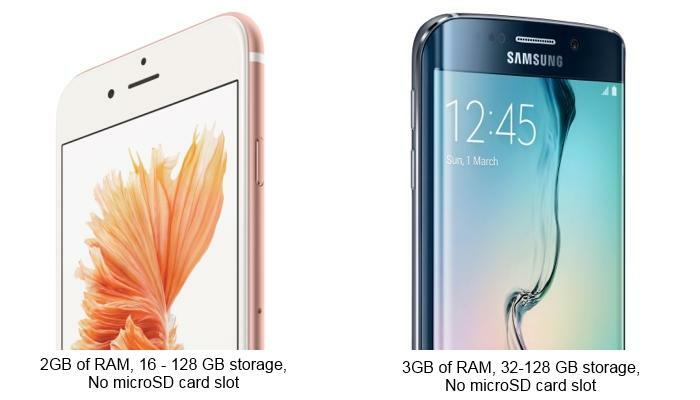 The S6 Edge or iPhone 6s you buy will have its storage capacity fixed. 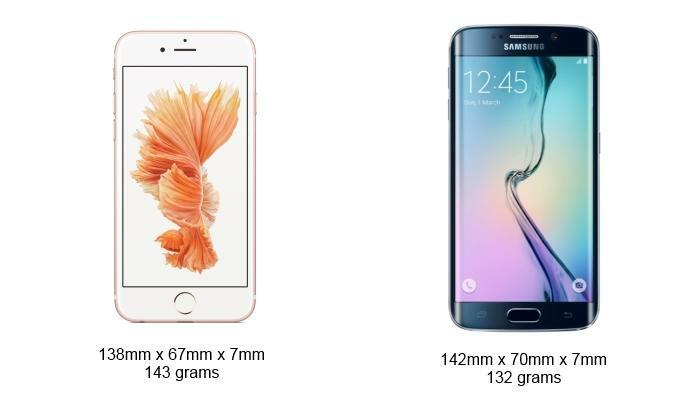 Otherwise the S6 comes with 3GB of RAM, which is greater than the reported 2GB of RAM found in the iPhone 6s. These numbers don't tell the full story. Last year's iPhone shipped with 1GB of RAM and that was enough to run the efficient iOS software seamlessly. 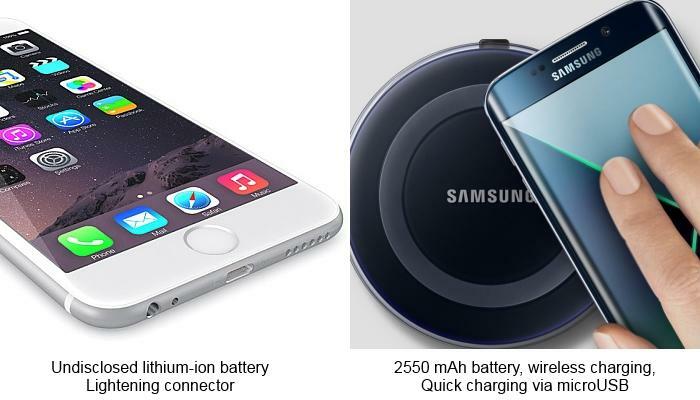 Yes, Samsung's Galaxy S6 Edge supports wireless charging, but our testing reveals it will take three-and-a-half hours to charge it from flat-to-full using a wireless charger. Odds are both these smartphones will hold charge for a day and most people will charge them using a wired charger. Both smartphones should charge in around the same time: Samsung's packs fast charging, but the iPhone will probably not need it because it's battery is smaller. Which smartphone you buy will likely boil down to the ecosystem to which all of your other devices belong. Own a Mac and an iPad, and you'll probably be happier buying the iPhone 6s. Samsung's smartphone is based on open-sourced Android and that's an operating system that does not discriminate. 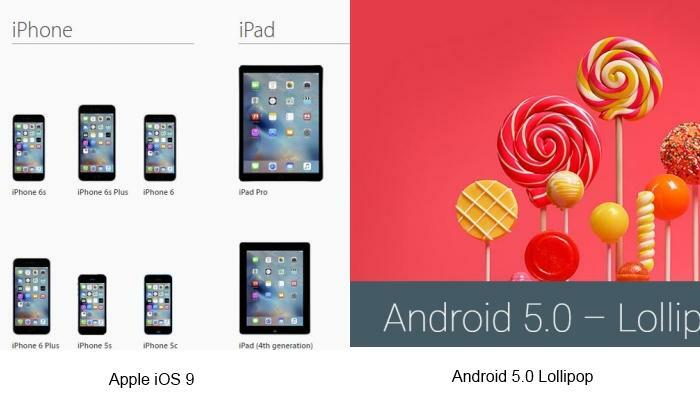 Google makes Android and its services work on a plethora of platforms. Customers win either way, as both platforms are refined, communicate with other devices and benefit from strong application support. Which smartphone are you going to buy? Tell us in the comments section below.